The ashes of Star Trek actor James Doohan have been successfully launched into space from a site in New Mexico, watched by cheering fans. Part of the remains of the actor, who played Montgomery "Scotty" Scott, were sent about 70 miles above the earth on a private SpaceLoft XL rocket. His widow Wende helped "press the button" for her husband's final voyage. Doohan's ashes were accompanied by the remains of former US astronaut Gordon Cooper and those of 200 other people. Star Trek creator Gene Roddenberry's remains were fired into space in 1997, six years after his death. Colonel Cooper's widow Susan was also involved in the suborbital launch of the rocket at 0856 local time. "For the amount of emotion that was involved, it was amazing how technical and smoothly everything ran," Mrs Doohan told the BBC. 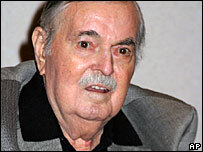 "He [James Doohan] would so have loved to have gone into space as Colonel Cooper did in real life. "He enjoyed some of that vicariously through Scotty and when Gene Roddenberry's ashes were sent into space, he said, 'That's what you have to do with me'." It was the first successful launch from Spaceport America, a commercial spaceport being developed in the southern New Mexico desert. The flight had been repeatedly delayed but organisers Space Services Inc and all those gathered at the private launchpad near the town of Hatch finally watched the historic flight take off into clear blue skies. During a 15-minute flight the rocket, which reached about 70 miles above the earth, separated into two parts which returned to Earth on parachutes with the capsules holding the remains. Family and friends were then to be reunited with the remains of their loved ones. Mrs Doohan and Mrs Cooper both said they believed Saturday's successful launch would boost interest in space tourism and make the prospect of space travel more accessible to the general public. Launching a single gram of ashes costs $495 (£248), while sending remains into deep space, a service which comes into effect from 2009 will cost up to $12,500 (£6,257). Doohan, a respected Irish-Canadian character actor, said he adopted a Scottish accent for his Star Trek role because it was commanding. Originally conceived as a minor character, Scotty became a core member of the Enterprise crew, often to be found protesting at Captain Kirk's ambitious plans. The line "Beam me up, Scotty" has become one of the most notorious misquotes in popular culture. Although Doohan became synonymous with the line, it was never actually said in the series. The closest Captain Kirk came to saying it was in the fourth Star Trek movie, when he said "Scotty, beam me up". Did you attend the launch in New Mexico? Have any got any pictures of the event?